Lacoste Full Zip Jacket In Navy, A water repellent jacket featuring a full front metal zip opening with a matte metal Lacoste logo zipper. A high collar featuring a concealed hood in navy. Press stud fastening cuffs on the long sleeves with two magnetic press stud fastening pockets on the waist. The signature embroidered Lacoste Crocodile logo is situated on the left of the chest in white, green, red, and black. A navy mesh lining with an elasticated drawstring on the hem interior. 100% Polyester. 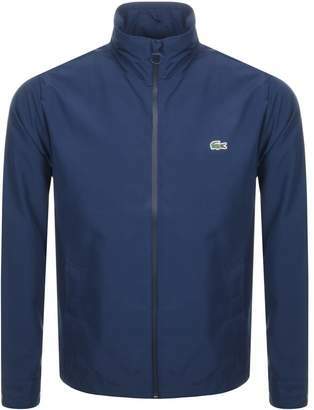 Brand New Collection Of Lacoste Jackets, Coats And Zip Tops Live.